The dossiers " Private individual Side "
Do you want to delete this selection ? You can replace the name of the city with information on the location of the property, example "City : Cadenet" becomes "City : South Luberon ". Hence, the city will be replaced by this information in all documents and advertisements to your customers. 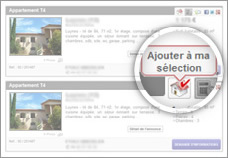 To increase your chances of success, Dmaisons provence will automatically extend the criteria. Example: Looking for a 2-room apartment, Dmaisons provence will also send you all advertisements with the number of rooms not specified. Your personal information will not be published.